Foot complications are very prevalent among people with diabetes. How common? The American Diabetes Association estimates that at least 20 percent of all diabetic-related doctor visits are spurred by foot concerns! Diabetes can cause nerve damage (neuropathy) and vascular damage, reducing your sensation. You may not even feel any injuries on your feet! Although extreme, it isn’t an overstatement that a minor foot injury on a diabetic person could become life-threatening. How many stories have you heard about a diabetic individual requiring a foot amputation because of a wound that got infected and would not heal? This 2017 systemic review of 19 studies verifies that up to 75% of all lower extremity amputations are performed on someone with diabetes! A lower extremity amputation (LEA) is no laughing matter; LEA could be anything from your little toe to both of your legs. It is vital that you take optimal care of your feet to lower your risks. Luckily, when it comes to prevention, two of the main factors are easy: toenails and pedicures. There is a common saying that diabetic individuals cannot trim their toenails. Some people would argue that it is a myth and that diabetic people can cut their toenails themselves. However, the real issue isn’t a matter of can or cannot, but whether or not you should. You might ask, why shouldn’t you cut your nails? Because if done incorrectly you could injure yourself! Furthermore, if you have diabetic neuropathy, it is recommended that you never cut your nails. Many people like to pamper themselves with a pedicure at a salon. For your safety, you need to be extra wary of the salon’s cleanliness standards, sanitation practices, and the skill and attentiveness of the technicians. If a technician is too rough or cuts you, you drastically increase your already raised risk of infection. If you have sensory issues in your feet you will need to specify that they only use warm water for the pedicure as the hot water may unintentionally scald your skin. A pedicure isn’t a treat if the technician hurts you. Instead of taking a risk with a regular nail salon, you should consider going to a medical spa instead. Receiving your pedicure from a medical spa is the best alternative to a regular nail salon! Since it is a medical spa, they are required to meet the Occupational Safety and Health Administration (OSHA) highest standards for sanitation and maintaining a clean environment to prevent the spreading of diseases, germs, bacteria, and fungus; you are guaranteed to receive a safe and hygienic pedicure. Technicians at a medical spa are trained especially for helping individuals with precise medical needs. The final concern with pedicures is so important that it needs to be addressed separately: how your toenails are cut and shaped. A regular nail salon will cut off all white growth from your toenails, regardless of the shape and length of your remaining nail. A medical spa will inspect your toenails to determine the best way to cut them. While you should never curve the corners on your nail, some professionals recommend filing the corners just enough to blunt any sharp edges. Additionally, trimming the nail too low encourages ingrown nails to develop. Ingrown toenails are serious when combined with diabetes. 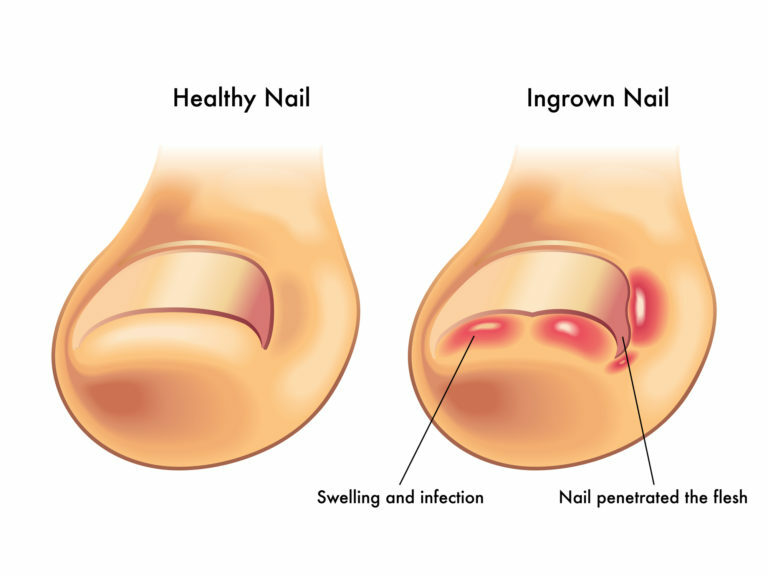 If you are not checking your feet daily and have neuropathy, then you may miss the early signs of ingrown nail and infection. Always treat any nail infection right away. Leaving an infection unchecked may result in the loss of your toenail or even your toe! It is not unknown for someone with poorly managed diabetes to ignore their ingrown toenail and subsequent infection, only to require a lower extremity amputation. There is no good reason to undergo easily preventable surgery! Regular visits with your podiatrist ensure that you are maintaining healthy foot care habits. Additionally, your podiatrist is much more likely to catch any potential issues early on. Always voice any concerns or questions you may have. Corona Foot and Ankle proudly offers preventative advice to help you lead a healthier lifestyle, including taking care of all your diabetic foot and ankle needs. We provide medical nail restoration services for damaged toenails and medical spa pedicures. You can schedule an appointment HERE.